He is getting older day by day,But Sachin Tendulkar is getting better with every passing day, former Australia captain Steve Waugh said. Sachin is improving every passing day and with prime form and Looking at the way Tendulkar is playing,it seems he can play till 50 years." Steve Waugh had earlier compared Tendulkar with Sir Don Bradman. On Coaching interest, the Australian great say he is not thinking about coaching now...Maybe in future,I will think about coaching. 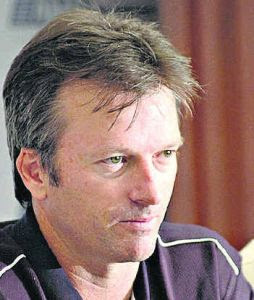 Waugh also praised India's South African coach Gary Kirsten's way of work while describing the jobs of a captain and a coach. The captain is always the boss on the field, as he has to be on the spot. The coach on the other hand plays a supporter's role quietly. Look at Kirsten. He goes on about his job very quietly which is exactly the coach's role. S Waugh termed Indians as favorites to defend the title in the second edition of the ICC World Twenty20 due in England in June. Indians have a very good side.The youngsters are really impressing and the IPL has done good for them.